Vendors, were you denied from a health fair and don't think the host is getting the full picture, not to mention, missing out on a great vendor? 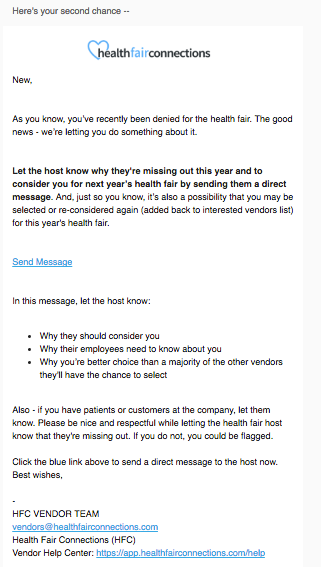 HFC now gives vendors a chance to email the host via HFC's messaging system once vendors have been denied from a health fair. Now, vendors can let the host know why they're missing out and to consider them next year. It is a possibility that vendors can be re-accepted into the health fair. This message functionality works nearly the same as the follow-up message functionality.